I used to think it was simply called a baby car seat until I became a mom for the first time. Well before our expected due date, my husband and I went to purchase the car seat to prepare for the day that we bring our baby girl home – which would also be the slowest car ride home ever. We found ourselves in the middle of the aisle. All the car seats on display were overwhelming to choose. There was a whole array of different car seats available. The sales associate approached and asked whether or not we needed help – the answer was YES! “Let’s start with what you’re looking for,” the sales associate beamed. “Are you looking for an infant car seat, convertible car seat, or a booster? And would that be forward-facing or rear-facing?” Confusion swept over my face, were we still talking about car seats? Or did I just enter an alternate universe? Clearly, there was a lot to learn. So here it is, a friendly mom-to-mom guide to choosing the right car seat. It covers which car seat should be used at different stages of your child’s growth and development. There are three types of car seats: an infant car seat (bucket with a handle), convertible car seat, and a booster seat. 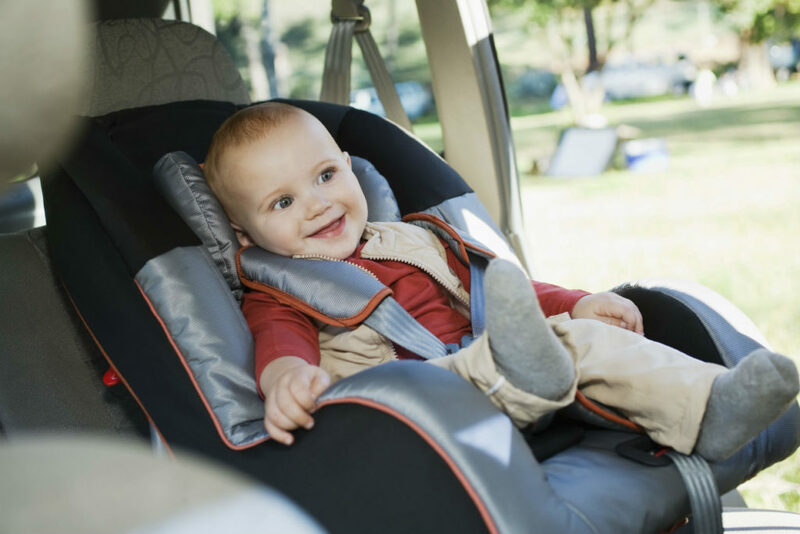 Each is used to fit your child’s growth and to keep them as safe as possible while on the road. With the exception of booster seats, you will have the option to choose either a forward-facing or rear-facing car seat. It is recommended that you choose a car seat that allows the child to be rear-facing (facing the back of the seat) for as long as possible) as it tends to move a safer position in case of a collision. They face the rear of the car and carry babies up to 22 lbs to 35 lbs, and 29″ to 32″ inches tall. Some rear-facing car seats can be used for children up to 20 kg (45 lb). 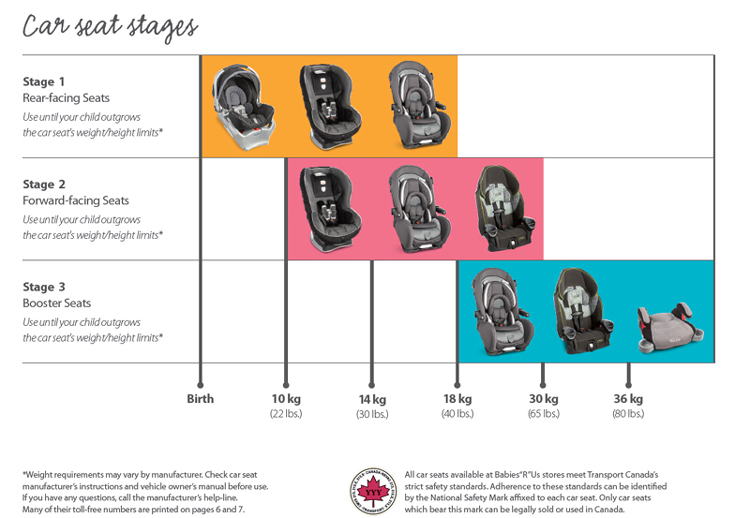 Once your child has outgrown their rear-facing car seat and is at least 10 kg (22 lb) and older than 12 months, you can begin to use a forward-facing car seat. A child who has outgrown the internal harness or height limitations of a forward-facing child safety seat. Within the range of 40 to 80 pounds but under 4’9”. Within 4 to 8 years of age and is at least 35” tall. In Ontario, children under age 8, who weigh less than 36 kg (80 lb.) and are under 145 cm (4′9″) tall must be secured in an appropriate child seat or booster. Once any of these limits are surpassed, the child only needs to wear a seat belt. Remember, your child’s car seat is only as safe as the vehicle it’s in. Put aside time to get regular maintenance services done on your vehicle. This ensures your car is operating at it’s best. You don’t want to find yourself stuck roadside with a car that won’t start and children in the car, this is something you can avoid when you take care of your vehicle’s maintenance needs. If you’re looking for a trusted mechanic that could help keep your family vehicle in tip-top shape, contact your local Master Mechanic, the most preferred auto repair shop in Peterborough. Contact us, and we will be happy to help you with all your car care needs!